“Plume Ideal Waterman” poster by Cappiello. Clown with two faces, one happy and one unhappy. The side with the happy face is holding a then modern Waterman Self Filling Fountain Pen, while the side with the unhappy face is tossing his quill dip pen. Leonetto Cappiello (1875-1942), born in Livorno, Italy, was one of the most important artists in the European Vintage poster movement. Cappiello moved to Paris early in his career to sell his caricatures to magazines. His work spanned the Art Nouveau and Art Deco periods, creating beautiful lithographs (French & Italian posters) with his unique use of colors and images. Cappiello posters appear in museums, galleries and private collections. 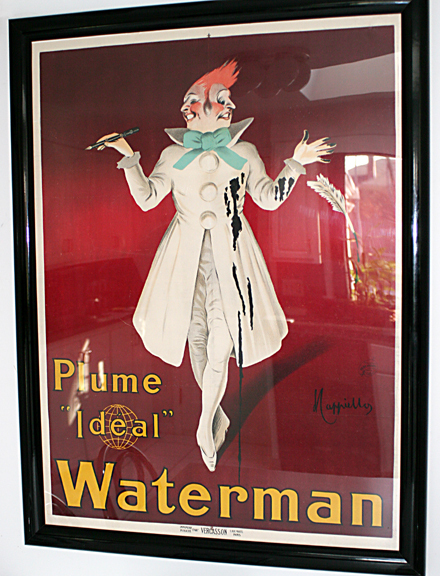 Waterman Paris commissioned the poster, designed to encourage the public to purchase Waterman self-filling fountain pens. Waterman USA started the “Dip No More” club around the same time, for the same purpose.